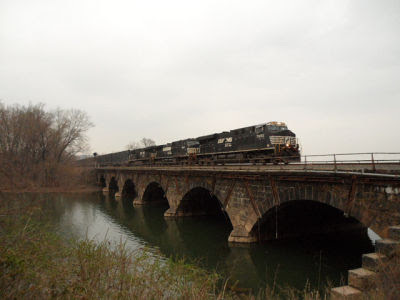 Motorists who drive north on Route 15 regularly have undoubtedly taken notice of the ancient stone railroad bridge crossing Sherman's Creek at the point where it empties into the Susquehanna River. With its six arches, this historic structure supports the enormous weight of the many trains which travel along the Norfolk Southern tracks each day, and has become one of the most photographed bridges in Perry County. Yet many of the railroad aficionados who stop to take pictures of the bridge, as well as the many fishermen who guide their boats beneath the arches, would be surprised to learn that this bridge has been rebuilt over the site of an earlier bridge that collapsed in one of the worst railroading disasters in Perry County history. Unlike the stone arch bridge that now spans the creek, the original Sherman's Creek bridge was a stone and iron Howe truss design, virtually identical to the bridge that collapsed over the Ashtabula River in Ohio in 1876, killing 92 people. Some reports indicate that the old Sherman's Creek bridge had been designed by Amasa Stone, who had also designed the Ashtabula railroad bridge. Stone, who never recovered after the Ashtabula disaster, committed suicide in 1883 by shooting himself through the heart. Like many similar disasters, the bridge collapse began with a storm. In 1886, the new year began with heavy rains, melting the ice and snow and causing extensive damage throughout much of Pennsylvania. In Hazeton, five collieries were flooded and 23 mules drowned. In the western part of the state, entire sections of Kittanning and Dubois were under water. Meanwhile, in Perry County, the Susquehanna and Juniata rivers and surrounding streams were spilling over their banks. Sherman's Creek was at its highest level since 1809 and the flood of January 1886 ultimately destroyed fifteen bridges spanning the creek. By the time the massive storm abated, the Susquehanna was 21 feet above its bed, overflowing its banks and flooding the nearby Duncannon Iron Works. 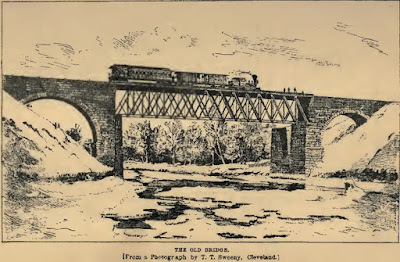 At eight o'clock on the evening of Monday, January 4, the fourth pier of the Sherman's Creek bridge was washed out by the raging waters, just as an eastbound freight train, the Huntingdon Local, was attempting to cross, carrying fifteen cars (eight of which belonged to the Duncannon Iron Works). The entire train plunged into the creek in a heap, with all fifteen cars piled atop the locomotive. Conductor T.B. Baldwin, brakemen A.G. McCahan, P.W. Turbett, John Williams and William Saylor, engineer W.H. Noel, and iron company employee John S. Miller all went down with the wreck. Brakeman Saylor, who had gotten off the train to check the bridge for safety, was the first man to go down. As fate would have it, an eastbound passenger train had safely crossed the bridge just twenty minutes earlier. 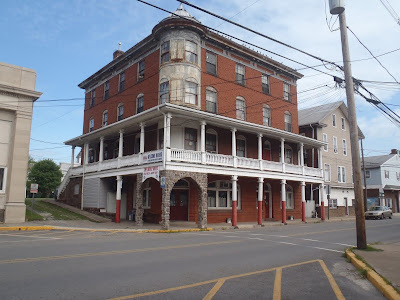 The alarm was promptly given and workmen from the Duncannon Iron Company, along with many of the borough's citizens, raced to the scene to rescue the train's crew. Without giving any thought to the icy water and dangerous conditions, the heroic iron workers plumbed the wreckage. Brakeman Turbett was rescued from beneath one of the mangled cars and taken to the Duncannon Station, but died from his injuries before he could receive medical attention. John Miller was rescued from the river, about a half mile below the wreck. Engineer Noel survived by clinging to a log and floating on it for two miles down the river until he was pulled to shore. The man responsible for saving the lives of Noel and Miller was the train's fireman, John McBride, who had jumped from the rear of the train as it fell into the water. McBride immediately ran down the tracks to the village of Cove, where he procured a boat from local residents Samuel White and Henry Eby. The workmen from the iron company labored through the night, searching for survivors and attempting to clear away debris. But as the dawn broke, the rescuers still hadn't been able to locate the bodies of conductor Baldwin and brakeman McCahan. It was believed that they were at the bottom of Sherman's Creek, pinned beneath the engine. Conductor Baldwin, ironically, had miraculously escaped death three years earlier after he was struck by the engine of the speedy Newport express. On January 5, officials with the Pennsylvania Railroad arrived at the scene with an army of laborers attempted to raise the wreck of the Huntingdon Local, but failed. Because of the economic importance of this crucial stretch of rail, plans were made to build a temporary trestle around the collapsed portion of bridge. Construction of this temporary structure began at once, and by January 8 trains could once again pass over Sherman's Creek. The body of conductor T.B. Baldwin was recovered after the water level had receded on the afternoon of January 12. The body was found close to the pier of the bridge, wedged between two freight cars, encased in ice and frozen solid. The body of conductor A.G. McCahan wasn't discovered until March 21, when it was found by two fishermen embedded in the mud about a half mile below Sherman's Creek. Harrisburg Telegraph, Jan. 5, 1886. Page 1. Harrisburg Telegraph, Jan. 6, 1886. Page 1. Perry County Democrat, Jan. 6, 1886. Page 3. Altoona Times, Jan. 6, 1886. Page 1. Harrisburg Telegraph, Jan. 7, 1886. Page 1. Newport News, Jan. 9, 1886. Page 1. Perry County Democrat, Jan. 13, 1886. Page 3. Harrisburg Telegraph, Jan. 13, 1886. Page 1. 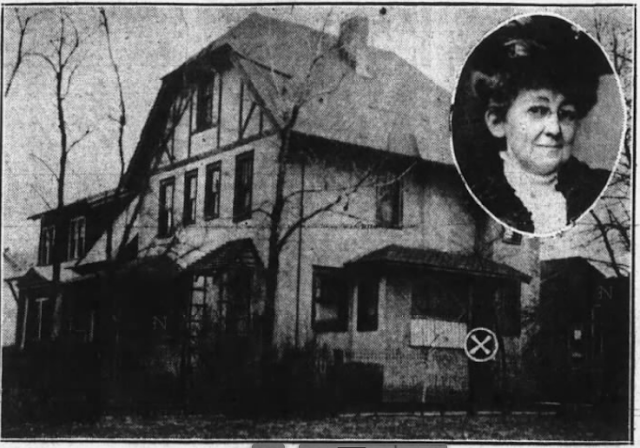 Wilkes-Barre Times leader, March 22, 1886. Page 1.